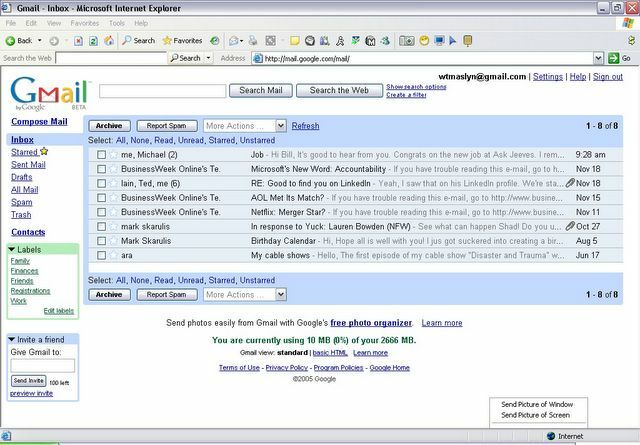 Those of you unfamiliar with GMail, it is Google's FREE web-based email service. It is currently still in beta, and the only way to sign up yourself is through text messaging on an SMS-enabled cell phone. You can, however, be invited by a current user. If you're interested, let me know. I have been using GMail for a few months, and while at first glance it looks like any other web-based email service, there are a few interesting features we haven't seen before. My favorite features of GMail, aside from its storage (almost 3 Gigs), are the search capabilities, its use of labels instead of folders, and how it groups messages into conversations. While the interface takes some getting used to, I have to say I like it. So let me know if you'd like me to invite you.